‘Unsustainable Deficits’ and Bond Boycotts: Panic at the Fed or Back to Financial Normalcy? Financial markets have reacted with jubilation, by buying dollars and selling Euros, at the decision by the Fed to raise rates for the first time since 2006 for its so-called Discount Rate, going from 0.5% to 0.75%. The Discount Rate is the interest rate charged for banks to borrow from the central bank. At the same time the Fed left its more important short-term Fed Funds rate unchanged and historically low — between 0.0% and 0.25%. In its official statement the Board of Governors said the rate move was intended to push private banks back into the private inter-bank borrowing market and away from reliance on Federal Reserve subsidized money which had been provided since the financial crisis began in August 2007. Translated into laymen’s language, that means savage cuts in Government spending at a time when real unemployment is running in the range of an unofficial 23% of the workforce, and the states are struggling to cut their own spending, as Federal dollars disappear. In brief, the United States economy, though no one is willing to say so, is caught in a Third World-style ‘debt trap.’ If the Government cuts the deficit, the economy sinks deeper into depression. But if it continues to print money and sell debt, buyers of US Treasury debt will at a certain point refuse to buy, meaning US interest rates could be forced severely high in the midst of depression conditions—equally catastrophic to the economy. The second option, a boycott by buyers of US bonds, may have already begun. On February 11, the US Treasury held an auction of $16 billion worth of 30-year bonds and securities to finance its exploding deficits. In a little-reported feature of a sale which did not go well in terms of demand, foreign central banks reduced their share of purchases from a recent average of 43% of the total to a mere 28%. The largest foreign central bank buyers of US debt in recent years have been China and Japan. Secondly, it appears that the Federal Reserve itself was forced to buy the slack demand, some 24% of the total of bonds sold versus 5% only a month before. The Federal deficit will reach an estimated $1.6 trillion in the current fiscal year that ends September 2010 and will continue next year and for at least another decade, above $1 trillion annually. The situation will be further aggravated because the largest generation born after the Second World War, the so-called Baby Boom generation born between 1945-1966, has just begun retiring in huge numbers. That deprives the Federal Government of their Social Security tax revenues, which will now go from an asset in the Federal budget to a liability, as the Government must pay out their monthly retirement pensions. This will hugely aggravate the size of the deficits over the next decade and longer. The highly-touted Clinton era Budget ‘surplus’ was in reality not the result of anything done by Clinton or his Treasury Secretaries Robert Rubin and Larry Summers. Rather it was because of the deceptive practice of counting on the Social Security tax revenues from that generation as US Government surplus revenue during their peak earning years in the late 1990s. That tax inflow has now begun to turn into what will be a huge outflow over the next decade. However, in the face of all this the White House seems to be implementing a series of foolish policies, with one action in direct contradiction to another. This is the case in terms of recent Washington behaviour towards China, the largest holder of US Government bonds, at least until this past month. The Obama White House has recently approved punitive import tariffs on Chinese auto tires. Then it increased friction in relations with its largest creditor by announcing a provocative new arms sale of billions of dollars to Taiwan over strong Chinese protest. In addition, Secretary of State Hillary Clinton has meddled in internal Chinese Internet regulation by openly criticizing China for alleged censorship. Then, as if to rub salt in a wound, despite further official Chinese protest, US President Obama officially met with the Dalai Lama in a Washington ceremony on February 18. Genuine concern for the well-being of Tibetan monks was not likely the reason. It was to signal heightened US pressure on China. Officially, to date, Beijing has reacted calmly, if firmly. Its real response, however, might be coming in a financial arena, not a political one, something that the ancient Chinese military philosopher, Sun Tzu, would have no doubt suggested. It appears that the Chinese government has already begun to react to the ill-timed US pressures on China by boycotting US Treasury debt buying. In December the Chinese were net sellers of US Government bonds, selling more than $ 43 billion worth of US debt. Given its huge annual trade surplus from its export earnings, the National Bank of China currently holds reserves of foreign currencies and other assets, including gold, worth $ 2.4 trillion. At least 60% of that is believed to be in US Treasury and other Government-guaranteed debt, perhaps some $1.4 trillion. If China continues to dump US debt onto international financial markets, the dollar will plunge and a full panic will ensue in Wall Street and beyond. That Fed move, as well as recent hedge fund and Wall Street attacks on the Euro in the context of the Greek events, are looking more and more like covert economic warfare for the future survival of the US dollar as world reserve currency. As my latest book, Gods of Money: Wall Street and the Death of the American Century explains, US global power since 1945 has depended on having the dollar as undisputed world reserve currency and the US military as the world’s dominant power. If the dollar falls away, the over-extended military becomes vulnerable as well. 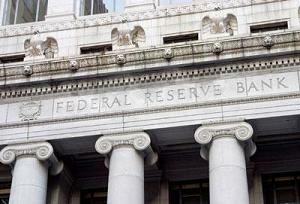 The Fed is in a desperate situation of trying to avert a full bond market selling panic that would trigger such a financial chain reaction collapse. This is why it raised one rate while leaving the more important Fed Funds rate at zero. It’s a desperate bluff. So far the lemmings in the financial markets appear to have bought the trick. How long that will last is unclear. As the Greek crisis is resolved and it becomes clear that the situation, however difficult, in Spain and Portugal and Italy are not about default, as their problems are no where near terminal, the prospects for the dollar and euro could change dramatically. In this situation China’s central bank holds major power to decide the possible outcome. One possible outcome of the growing global impasse is the prospect that the People’s Bank of China will dramatically increase its purchases of gold and silver reserves. That, in turn, could serve China far better than buying more US debt, and serve as a basis to establish a future role of its currency in regional trade and international business independent of the dollar or the euro. China’s gold reserves until recently have been relatively low compared to the size of its reserves. Official Chinese central bank gold reserves were 1,054 tons as of March 2009, worth about $37 billion at today’s prices. That represents a mere 1.5% of its total reserves, and that is itself up by 76% since 2003. On average, international central banks hold about 10% of their reserves in gold. The German Bundesbank holds some 3,400 tons of gold, the second largest after the US Federal Reserve. To even get to that 10% level, China would have to buy more than $200 billion worth – about two years’ global mine output. Silver is not a significant part of most countries’ reserves, but China is historically an exception, since in Imperial times before 1900 it was on a silver standard rather a gold standard, and so retained substantial silver reserves. One aim of the 1840’s British ‘Opium Wars’ against China was to drain the Chinese state of its entire silver currency reserves to the advantage of the British gold standard. In 2001 and 2002 China was a major seller of silver, selling a total of 100 million ounces at its then-price of less than $5 an ounce. Since then, it has stopped selling silver. Last September 2009, the Chinese government passed a decree encouraging Chinese savers to buy silver, explaining that buying silver was a good deal since the gold/silver price ratio at 70-to-1 was historically very high, offering them convenient small-value ingots with which to buy it, and prohibiting the export of silver from China. This was almost certainly a move designed to dampen stock-market speculation and reduce money supply growth, since bank deposits converted into silver would effectively be sterilized. What’s more, if the long-awaited Chinese banking crisis ever developed, the effect on the long-suffering Chinese public would be mitigated if people held substantial wealth in the form of readily negotiable silver ingots. It’s likely that China is now a very large buyer of silver, possibly even more than gold. Thus, a selloff in People’s Bank of China holdings of US Treasuries could be offset by purchases of gold for its own account and of silver to supply to the Chinese public. F. William Engdahl, author of Gods of Money: Wall Street and the Death of the American Century.